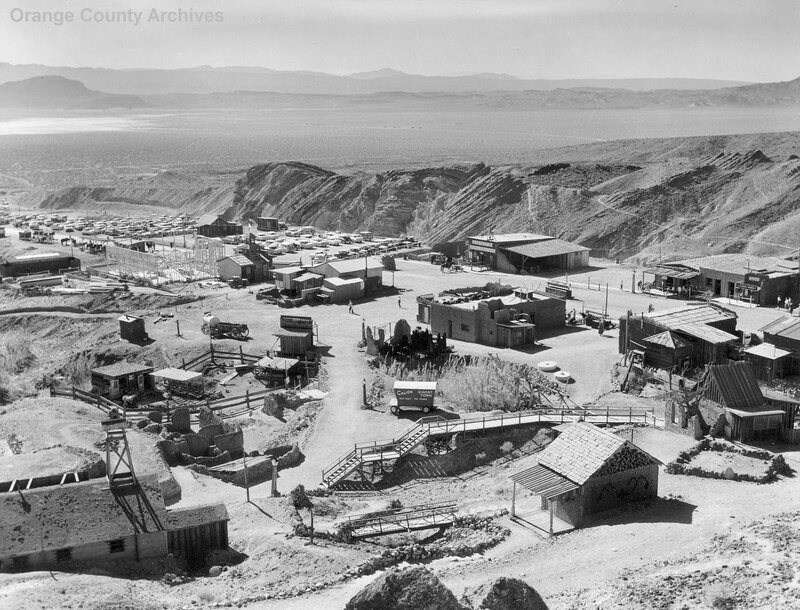 The little town of Calico, near Yermo, California, sprang to life with a silver boom. At it's peak the place had about 1,200 residents. But like most boom towns, things went bust. 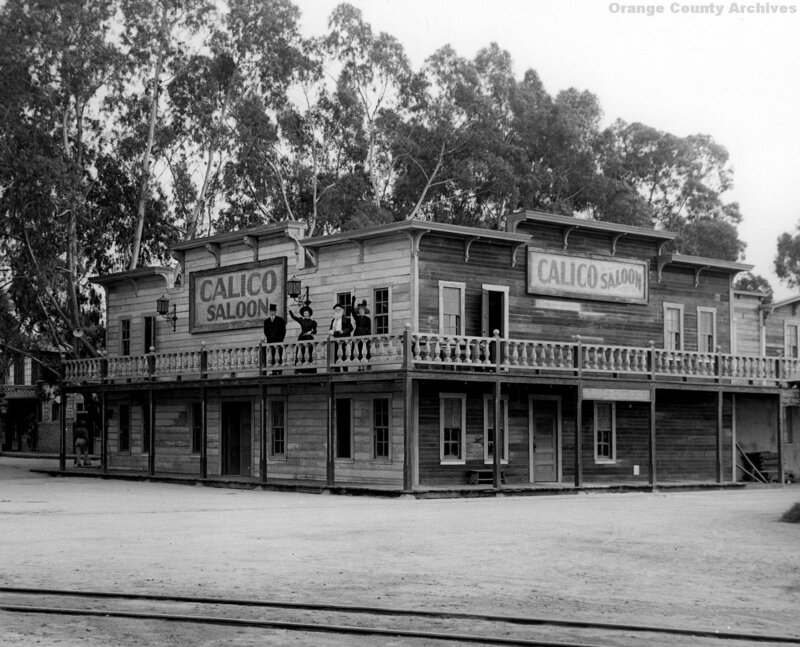 After a short but lively existance, from 1881 to 1896, Calico quickly faded into a "ghost town," as seen in the photo above. In 1951, just ten years after opening his highly sucessful mock ghost town in Buena Park, Walter Knott purchased the entire real ghost town of Calico. He already had a couple personal links to the site. First, he had briefly worked as a carpenter during a short-lived scheme to revive one of Calico's mines. Secondly, Walter's uncle, lawman John C. King helped found Calico and was a key partner in its most productive mine: The Silver King. 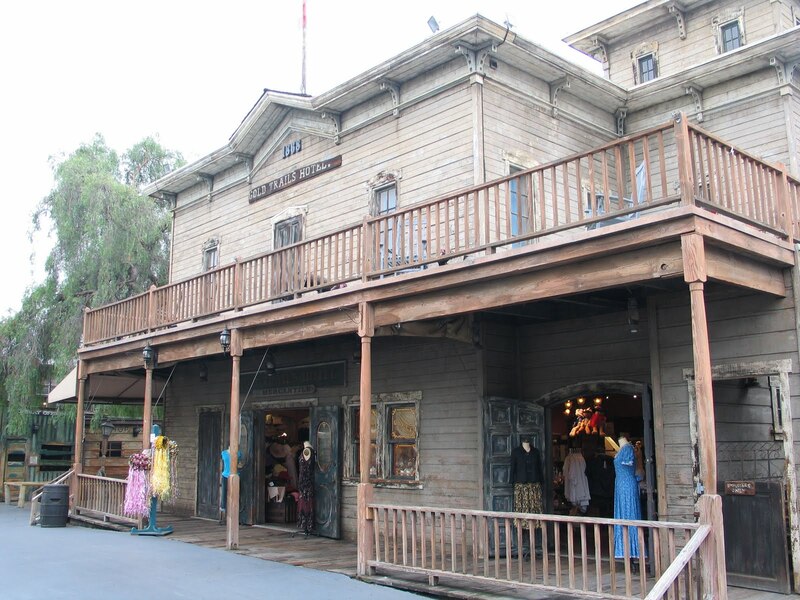 The Knotts rebuilt many of the long-since-missing buildings in town, and added a few additional buildings they thought would help the tourist trade. Like Ghost Town at Knott's Berry Farm, Calico soon had a general store full of tourist tchotchkes, a saloon serving boysenberry punch, a train ride, a gussied-up mine to explore, mule rides, a "Mystery Shack," and much more. In the photos below you can see what the town looked like during Knott's reconstruction effort in the 1950s and what it looks like today. Note that both images are taken from a similar angle to the older image above. Ultimately, government interference kept Walter from making Calico the kind of financial success he had hoped. 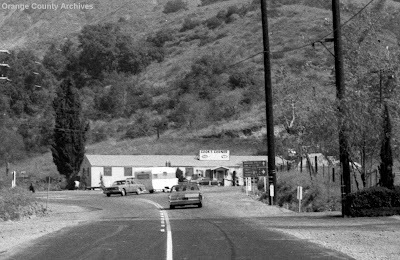 In 1966, he gifted the whole town to the County of San Bernardino, and it became a regional park. Today, visitors can see all the layers of the site's history: From prehistoric rock formations, to silver mining boom town, to 1950s roadside attraction, to county historical park. All of it is fascinating. I'll share more Calico photos with you in the coming days. 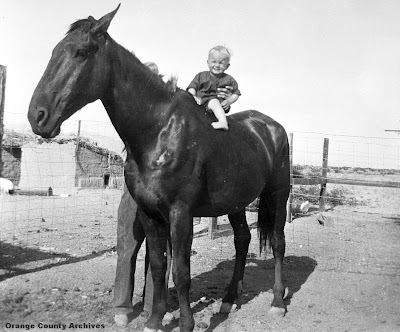 Walter Knott and his cousin, Jim Preston, rented land south of Buena Park and started growing berries there in 1920. They soon opened a berry stand and then a nursery to sell berry plants. The before-and-after photos above show the original berry stand around 1926 and that exact same location as it appears today. After a while, Jim left to run his own farm in Norwalk. 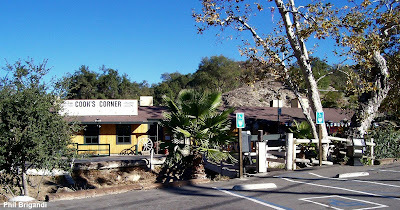 Then Cordelia Knott added a tea room, which eventually grew into the popular Knott's Chicken Dinner Restaurant (which turned 75 this year). Their daughter, Virginia, opened a small gift shop which grew into a large one. Walter started adding attractions to occupy visitors while they waited for a table at the restaurant. Eventually, this string of small attractions led to a larger one -- A replica of a Ghost Town, which opened to the public in 1941. One of the earliest attractions in Ghost Town was the Wagon Train Show, in the Gold Trails Hotel, which appears in the before-and-after photos below. 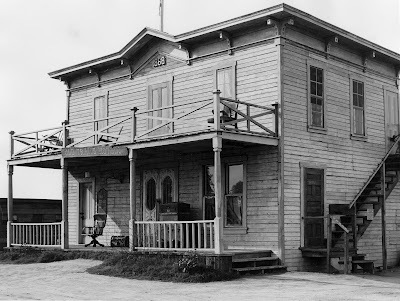 The older photo shows the hotel (new construction, incorporating a few pieces of buildings in actual ghost towns) in the 1940s. The "after" photo shows the recently rebuilt hotel as it appears today. I won't give you a blow-by-blow account of all the ways Knott's Berry Farm prospered and grew. It's a pretty well known story. Suffice it to say, it was very, very successful, owing in large part to the hard work of the Knott family themselves. The photos below show a later addition to Ghost Town: The Calico Saloon. The first image shows it when it was new, around 1952, and the second image shows it as it appears today. The Calico Saloon sat right across from the Calico Mine Ride and the Calico and Ghost Town Railroad on Calico Square. Why were all these 1950s and early 1960s additions named "Calico?" Stay tuned. The Knott's long experiment in the Mojave proved a failure. 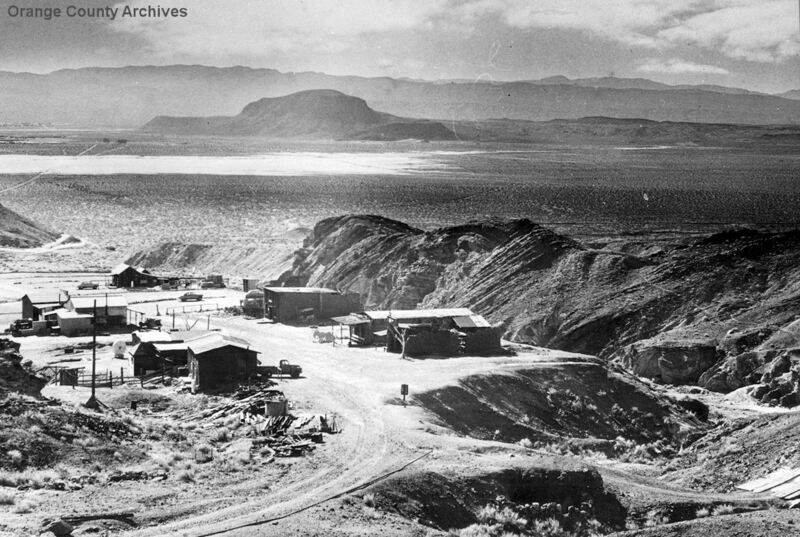 Walter took other jobs nearby, including one as a carpenter in a short-lived scheme to revive a silver mine at Calico. (More on Calico later.) But it was clear that they needed a new start -- And that start appeared in the form of a job in Shandon, California, near Paso Robles. Walter was allowed to use a strip of land to raise fruits and vegetables for the ranch hands, and could sell anything they didn't eat. It turned out he had a lot left to take to market. Combined with income from Cordelia's new business making candy for nearby shops, they were soon solvent again. The strip of land Walter farmed in Shandon is shown below. 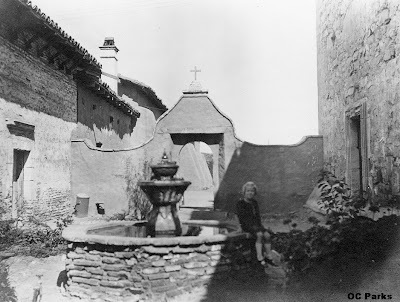 It lay between the Estrella River and the home of the ranch owner, which is shown above in its current (vacant) state. On their feet once again, they were prepared when, in 1920, Walter's cousin Jim Preston suggested they move south and partner with him to start a berry farm near Buena Park. Indeed, without the time they spent in Shandon, there would have been no Preston & Knott's Berry Place (later known as Knott's Berry Farm). The photo below shows the Shandon property from another angle. It took Katie and me a good deal of time tracking around Shandon to find this location when we visited last year. My research had only turned up a few sketchy descriptions of the property. Luckily, the guys at the local San Luis Obispo County Fire Station pointed us to a knowledgeable local rancher who in turn led us to the entrance of the Red Cedar Vinyard, where we found the ranch house. 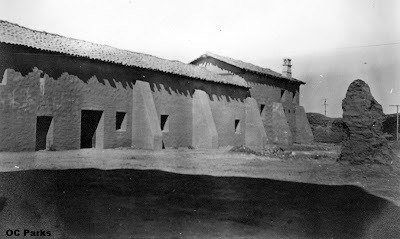 Of course, the Knotts didn't live in the big adobe ranch house. They undoubtedly lived "in town." I never did figure out an address for them. The photo below shows the local United Methodist Church and gives you an idea of the kind of town we're talking about,... Small. Rural. A little bit charming around the edges. There are about 1,000 residents living there today. The ones I met were friendly and helpful. Old-timers in town still remember the Knotts fondly, and recall being treated with the utmost hospitality when they later visited their old neighbors in Buena Park. Today's images are before-and-after photos of the Knott homestead in Newberry Springs. Aside from the small house disappearing, things haven't changed much since the family left. But with no buildings to use as landmarks, the mountains in the distance were our only guide. The photos above look west and the ones below look east. One wonders if struggling like pioneers in an inhospitable place somehow appealed to Walter Knott (who grew up with his grandmother's stories of coming west in a covered wagon), or whether it was just the free land that appealed to him. Or perhaps a bit of both. Standing in the middle of the desert, looking at this land, one can well imagine how hard living here must have been for Cordelia. Walter probably didn't enjoy it much either, but at least it was his idea. And as Phil pointed out, "Cordelia was a city girl" and not used to roughing it. 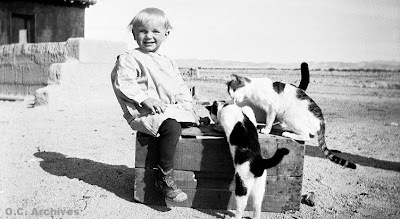 The second stop on our Knott trek was the parcel of land Walter and Cordelia homesteaded in Newberry Springs on the Mojave Desert from about 1914 to about 1917. The photo above shows what it looks like today. The Knotts tried to grow grapes here, which proved to be one of their few significant business missteps. However, they still stuck it out long enough (three years) to establish the homestead. The black and white photos in today's post are from the homestead and show the Knott kids, Cordelia, and the family dog with a number of turkeys. I don't know if I'll get to post again before the 26th, so I'd better make use of these gratuitous gobbler shots while I can. If you don't hear from me before then (or even if you do), have a happy Thanksgiving! On Saturday, Phil, Katie and I headed east, out of Orange County (*gasp! *) to do a sort of "Walking in Walter Knott's Footsteps" tour. 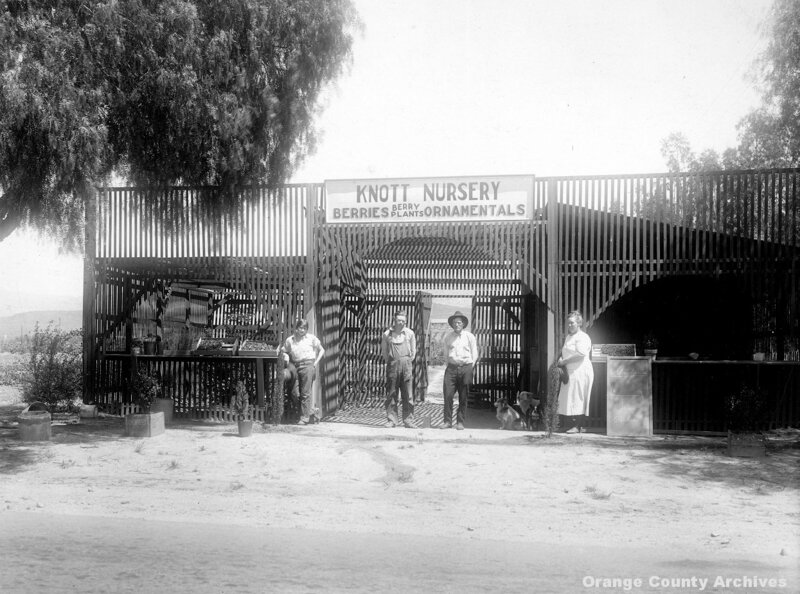 Our first stop was Norco, where we found the site where the Knotts started a second berry stand and nursery. It never took off like the original Knott's Berry Farm in Buena Park. 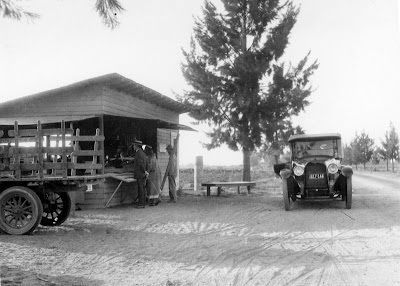 The photo above shows the Norco stand and nursery in about 1930, at the corner of Hamner Ave. and 3rd Street. (They also grew berries not far away.) The photo below shows what the same spot looked like as of Saturday. 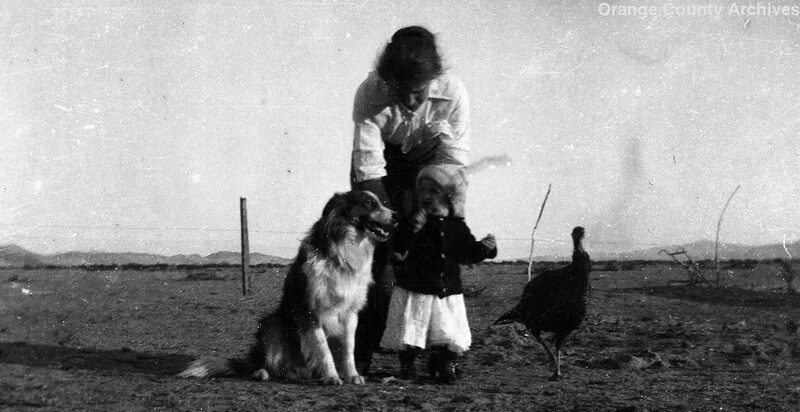 Our next stop was in Newberry Springs, on the Mojave Desert, where Walter and Cordelia Knott homesteaded some land and went broke. Then we spent the rest of the day at the old mining town of Calico, which the Knotts purchased, rebuilt, and turned into a tourist attraction in the 1950s. In the coming days, I'll share photos of the homestead and Calico, along with additional information to shed more light on the Knott's story. Here are a few more postcards from Tom Pulley's collection -- This time depicting Anaheim. 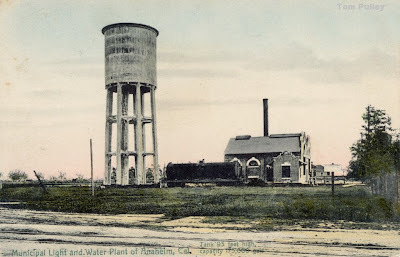 The postcard above shows the Municipal Light and Water Plant. (Nod to Steve Faessel.) 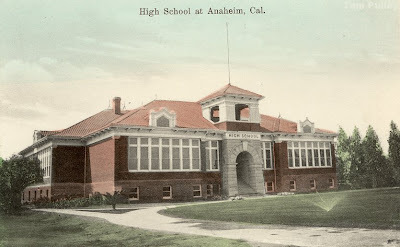 The image below shows an earlier incarnation of Anaheim High School. This last image (below) is from 1916 and is just one of many similar generic card designs featuring Dutch children. (Their accents always seem more German than Dutch to me, but I could be wrong.) 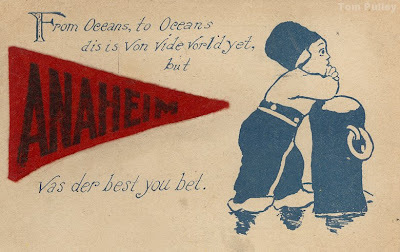 The pennants or other decorative motifs featuring the cities names were always added later, allowing the same cards to be sold anywhere as "local." I don't quite understand what the appeal was -- But then I don't really understand the appeal of Family Circus, Precious Moments or Hello Kitty either. Self-described "info sherpa" Richard K. Moore writes, "...With the assistance of library volunteer Stuart Gitlin, the [Huntington Beach Public] Library has digitized over 300 historical documents about the City of Huntington Beach and the Library. These scanned Adobe PDF files are useful to anyone interested in researching local history. For example, a popular school assignment is finding out how a local street got its name." All these documents are now available on the library's website. (This project seems like the logical next step after the historical booklets Alicia Wentworth used to put together.) I'm sure I will spend way too much time reading through this stuff in the coming weeks. 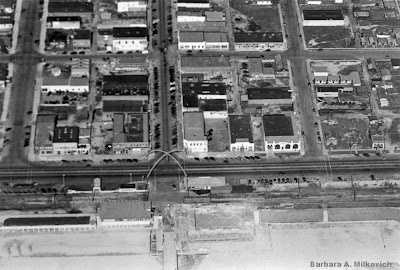 Today's photo shows the Huntington Beach Pier, the Golden Bear, the Pav-a-lon and other downtown highlights in the 1930s. The crossed arches stood over the intersection of Main St. and Pacific Coast Highway. The photo comes from the collection of Barbara A. Milkovich. 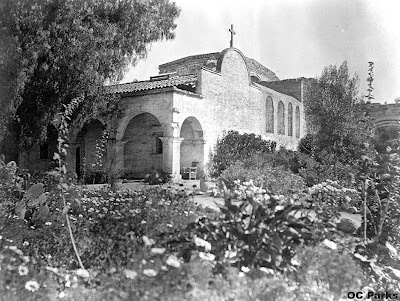 Today I'm posting three photos of Mission San Juan Capistrano taken in 1923. All three come from the Pierce Collection, which is held by the Old Courthouse Museum. The one above shows the Serra Chapel. The other two are fairly self explanatory, except to mention that the girl sitting on the fountain is Helen Pierce. The historic Evangeline Hotel (1906) in Huntington Beach has dropped in price again,... to only a million dollars. The Bowers Museum blog has added posts about the business ledger of Don Tomás Yorba and the "Maze Rock" from Trabuco Canyon. Major Pepperidge recently posted some 1971 images of Lion Country Safari and the Japanese Village & Deer Park. Stuff From The Park recently added posts about Knott's Berry Tales and about an event I'm sad I wasn't around to see: "Dixieland at Disneyland." Can you imagine getting to see Louis Armstrong, Kid Ory, The Firehouse Five Plus Two, and all those other talented musicians perform for the (then) low fee to enter Disneyland? And speaking of Disneyland, Vintage Disneyland Tickets recently posted some great Disneyland concept art from a 1955 McCall's magazine. 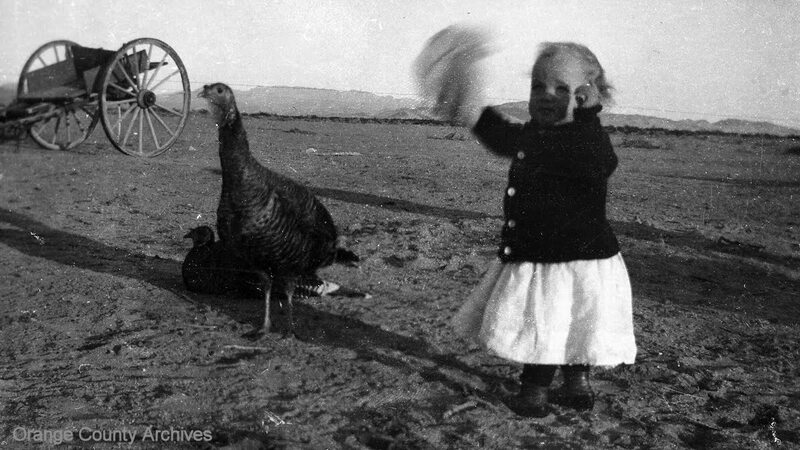 Well before Walter and Cordelia Knott made their fortunes with berries and chicken dinners, they went broke trying to farm on the Mojave Desert. Farming on the desert may sound crazy, but today there are thriving farms in the area. 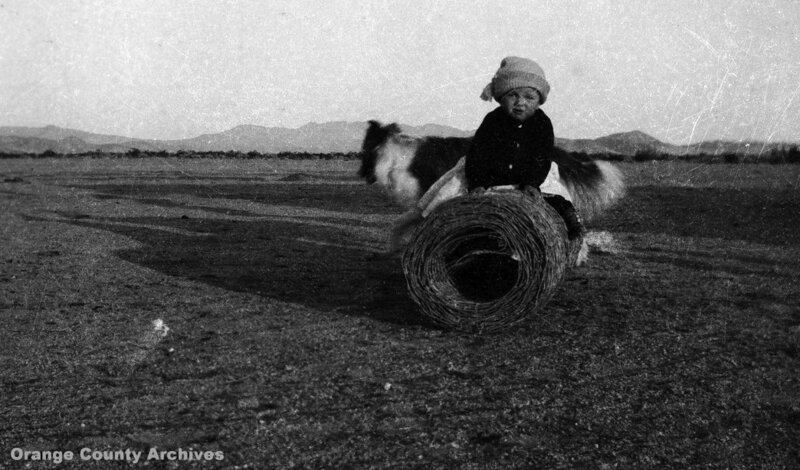 Also, Walter had already experienced some success in the Coachella Valley -- land many considered relatively worthless in those days. 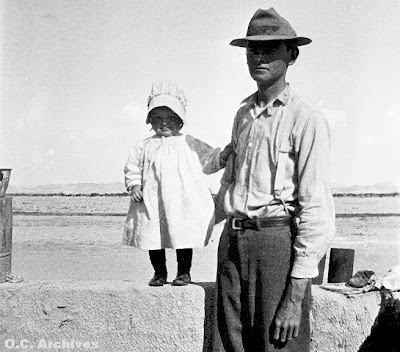 Today's photos (all from the Orange County Archives) show the Knotts on their Mojave homestead in the late 1910s. The photo at the top of today's post shows Walter and probably Virginia Knott. The image immediately above shows Cordelia with the children (probably Virginia and Russell Knott). 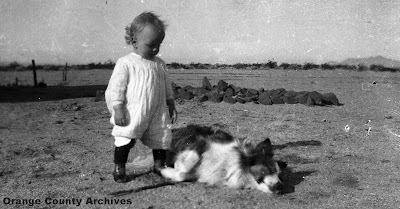 And the photo below shows Russell with some furry friends. I'll probably post more about the Knotts' desert experiences in a week or two. The 15th annual Pitcher Park Persimmon Party will be held tomorrow, (Sunday,) noon to 3pm, at Pitcher Park, on the corner of Almond and Cambridge, in Old Towne Orange. (Sorry about the late notice!) Our friend Lisa Ackerman writes, "Pitcher park gets its name from the Pitcher family who owned the parcel for decades. They deeded the land over to the city for use as a passive park, and the Honey House and small Pitcher Park Museum and Fire Museum also occupy this postage stamp sized park. People can learn about all things persimmon there, buy persimmons and persimmon baked goods, a persimmon cookbook, and enjoy blue grass music, too! A fun little homespun celebration unlike anything else in Orange County. Or anywhere else, for that matter! Proceeds go to benefit the Pitcher Park Foundation, which educates school children and the community on our agrarian and community roots." Local architect Richard H. Dodd will lecture on "The Embodiment of the Arts and Crafts Movement," Nov. 18, 7-9pm at Sherman Gardens, 2647 E. Pacific Coast Hwy, in Corona del Mar. The event is free. Call 949-673-2261 to RSVP. Mr. Dodd will also be among the authors featured at the Orange County Historical Society's Authors Night on Dec. 10th, which I'll tell you more about very soon. 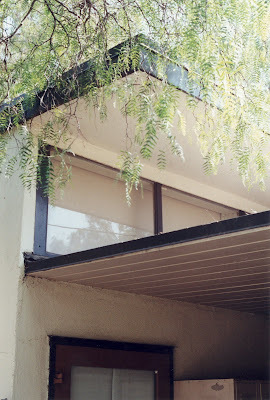 Today I'm posting some photos of the old Richard Neutra-designed Art Center at Orange Coast College in Costa Mesa. 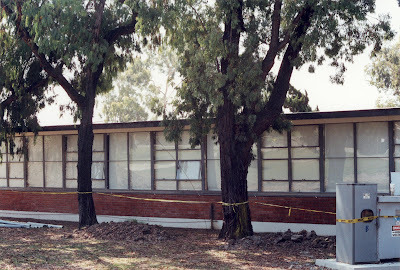 I took these photos in 2000, just before the place was demolished. 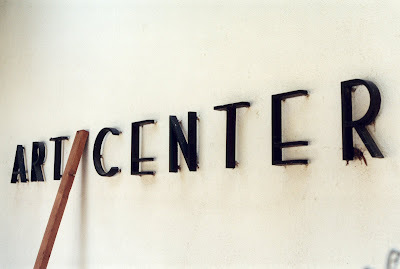 The old Art Center was extremely functional and was an inspiring place to work. It also very effectively accomplished the California Modern goal of blending indoor living and outdoor living seamlessly. I'm sorry I didn't get more and better photos of the place before most of it was cordoned off. Remember the "Knott's Beary Tales" ride at Knott's Berry Farm? Major Pepperidge at Gorillas Don't Blog has posted a great "fun map" of the ride illustrated by Chris Merritt, along with some other great images from Chris's collection. . Despite earlier reports to the contrary, it sounds like the County is still looking for viable reuses for their historic Tustin Lighter-Than-Air Hangar. This is good news! If you have any economically viable reuse ideas, please feel free to post them in the Comments section below. It's certainly unofficial, but you never know who may be reading this blog or whether your suggestion might start a useful conversation. Indoor theme park? World's only indoor drive-in movie theater? I figure you can never have too many good ideas..
A new documentary about the groundbreaking Mendez v. Westminster desegregation case was shown today at Fullerton College. (Sorry I didn't hear about this soon enough to post about it earlier. If you have an interest in this subject, you might keep your ear to the ground for future showings of, "Tales of a Golden State: The Mendez v. Westminster Story," by Erica Bennett. I'd like to reiterate something my Blogger profile has said from day one: "This blog is maintained in my free time. Views expressed here are mine alone." In other words, this is my blog, and I'm the one responsible for its content. That said, I definitely welcome your corrections, complaints, suggestions, kudos, or other comments. I do the best I can, but I always appreciate an assist. However, please contact me directly if you have a concern. We can almost always work things out and make corrections if needed. Thanks. Back for one more pass at Bolsa Chica in Huntington Beach. 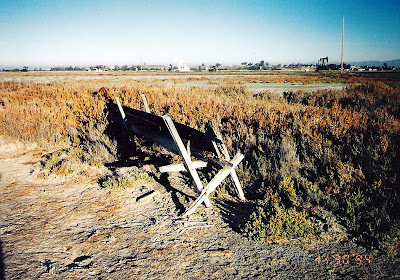 During WWII, the Bolsa Chica Gun Club's land became part of our nation's coastal defense. Bunkers were built on the ridge behind the old clubhouse, and the area was dotted with large gun emplacements. 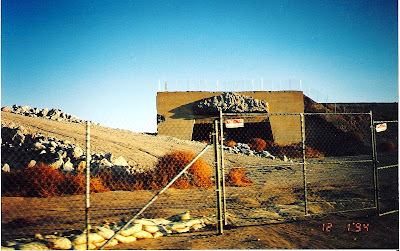 The photo above by Doug McIntosh shows one of the bunkers being demolished in 1994. 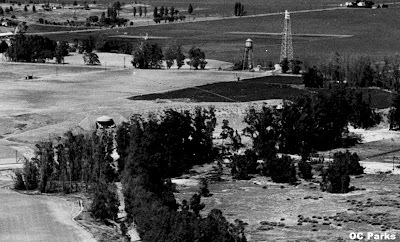 The image below shows the area from the air in 1954. The most noticable extant features of the WWII era at Bolsa Chica are the round concrete gun emplacements along the edge of the bluff. (Not shown in this photo.) These were never actually fitted with guns. The contractors didn't build them to the military's specifications. Ironically, these "rejects" are the once piece of this defense outpost that still stands today. Sorry I didn't get a chance to post over the holiday. As always -- many, many thanks to our veterans. 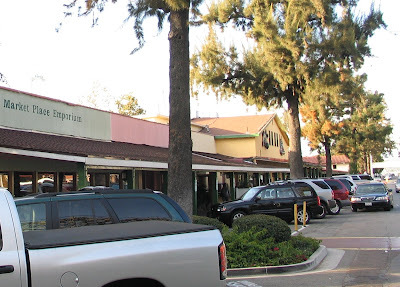 Jane Norgren brough in these photos of El Toro on the cusp of suburban development. (Probably the late 1960 or early 1970s.) 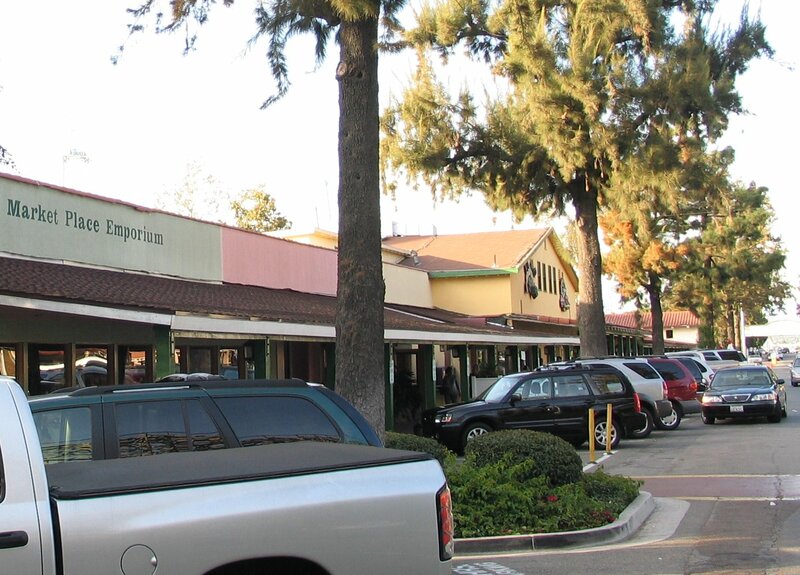 The Old West was rapidly being overtaken by tract housing. 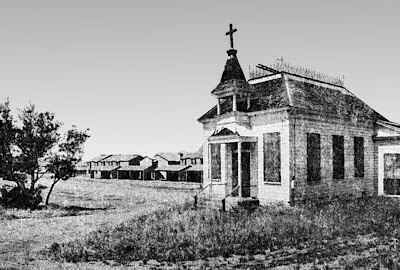 A number of the old buildings in El Toro, including St. George's Episcopal Mission (seen in the first photo), were saved by moving them to Heritage Hill Historical Park. 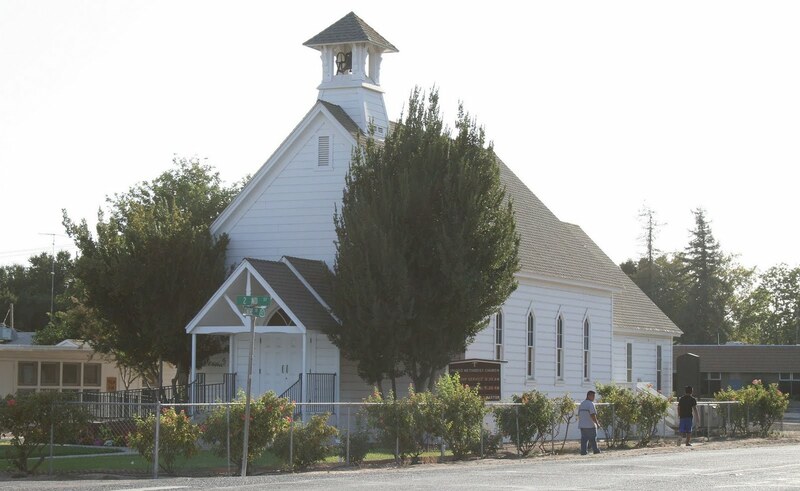 Correction: Sue McIntire of OC Parks' South County Historical Parks division writes that the building with the cross on top "is actually the El Toro School. When the new two-room school house was built in 1914 this one was purchased and moved to El Toro Road and was used as St. Anthony’s Catholic Church until 1968. It sat vacant and took a licking from 1968 to 1976 when the County got it. This picture says so much to me with the 1970s houses in the background and the school left to die. The actual end of the era…." 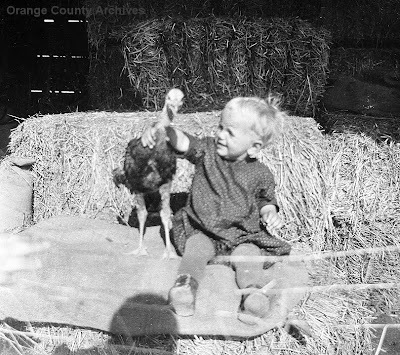 One of Orange County's best-known early photographers, Edward Cochems, will be the topic of a lecture by Michelle Light of UCI's Special Collections and Archives at a special event at the Old Orange County Courthouse, Nov. 19, 7-8:30pm. The program will feature Cochems work between 1920 and 1945, including many unpublished, unique images from UCI's collection. There will be a reception after the talk. RSVP to (714) 973-6610. The O.C. Gazette recently ran an article about Cook's Corner. I thought I might expand a little on the subject here. Andrew J. Cook was born in Missouri on May 9, 1846 to Hyram and Roseana Cook. Voter records show him having a fair complexion and blue eyes. In 1850 he lived in Tomlinson, Arkansas. In 1870 he lived in Los Nietos in Los Angeles County. 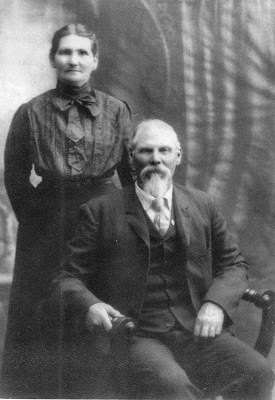 He married Mary Ann Barker in Downey, California on Oct. 12, 1871. 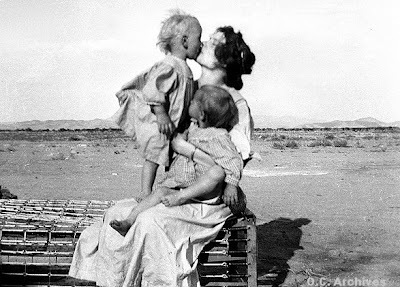 He and Mary (shown in the photo above), and their many children lived in Phoenix, Arizona prior to moving Orange County. Andrew died April 20, 1905 here in Orange County. 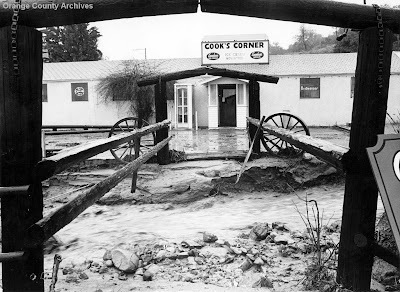 The photo above (courtesy the Orange County Archives) shows Cook's Corner during the flood of 1969. 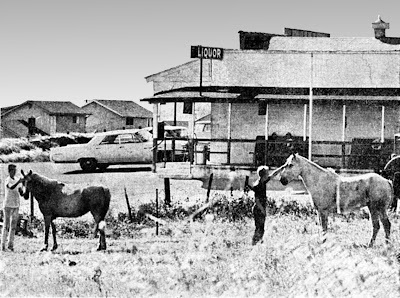 The photo above shows the place in 1970. 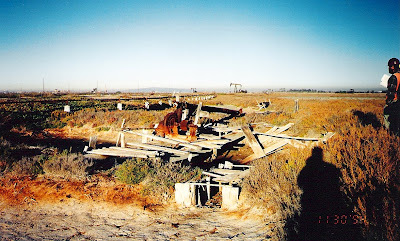 In response to my recent post about the Bolsa Chica Gun Club in Huntington Beach, my archaeologist pal, Doug McIntosh wrote that in late 1994 "we did a job at the gun club site. 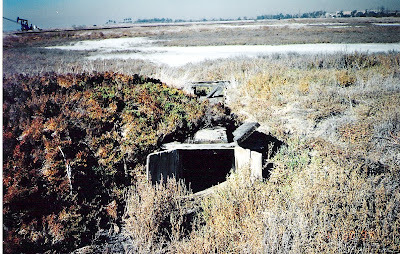 Documented several of the hunting blinds and the pumping system which supplied fresh water into the marsh. The wooden hunting blind features were littered with old brass shot gun shells and broken Perrier-style mineral water bottles. It was a real treat to see these features..."
Doug provided all of today's photos, including the culvert (with gate) shown above, and the old flume seen below. Doug writes, "The features are of milled redwood and dated to the gun club period of operation... 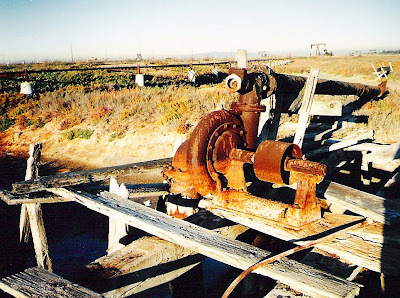 The salts in the ground aided in preserving many of wooden blinds and flume system which supplied fresh water..."
The image above shows a Byron Jackson centrifugal pump (post-1909). 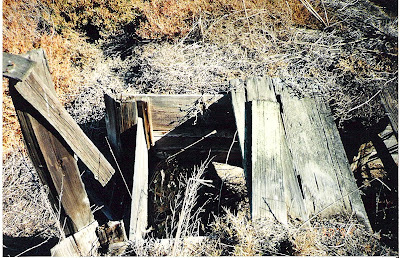 The image below shows a wooden culvert. Note the oil well and bluffs in the background. Doug also writes that, coincidentally, "In the early 1930s our family, which supplied the Alpha Beta grocery store chain with beef, leased some of this area to graze cattle." 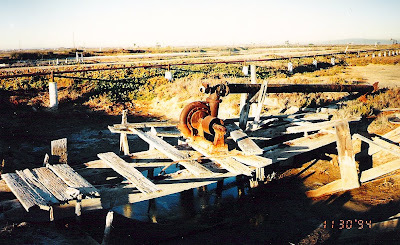 The photo above shows the pump, wooden culvert, and Doug's shadow. (Dontcha hate it when that happens?) Another closeup of the pump and its platform are shown below. Personally, I remember seeing even more bits of the old Gun Club still standing when I used to haunt this area as a kid. I wouldn't be surprised if things went missing between the late 1980s and the mid-1990s. I took some photos back then, but I have to find them before I can share them here.